A new study suggests patients diagnosed with uveal melanoma could benefit from immunotherapies that harness the body’s own anti-tumor T-cell populations. Uveal melanoma is a cancer of the eye involving the iris, the muscle surrounding the lens, or the choroid – a vascular layer with connective tissue between the retina and the sclera. It is a rare form of eye cancer with no effective therapies once it spreads to other parts of the body. Uveal melanoma is related to more common cutaneous (skin) melanoma. Doctors have had success treating skin cancers with immunotherapies that boost naturally existing anti-tumor T-cell responses. In essence, this approach boosts the body’s natural immune system response to fight the tumor. For instance, a drug called Keytruda was used to successfully treat Jimmy Carter’s melanoma. But despite the success of immunotherapy in attacking more common skin cancer tumors after it spreads, the role of this type of treatment for metastatic uveal melanoma remains unclear. Fifteen researchers from the National Cancer Institute and other institutions embarked on a study to determine if this type of anti-tumor immune response exists against uveal melanoma. To conduct the study, researchers surgically procured metastases from the livers of eye cancer and skin cancer patients. They then compared the tumor cell structures along with their associated T-cells using a variety of techniques. Researchers found that despite the fact both are related to melanoma, the tumor cells differed in melanin content, the antigens provoking an immune response, and in their genetic mutations. The T-cells attacking the tumors were also different. Researchers found that anti-tumor T-cells in cutaneous melanoma were predominantly CD8+ while those in uveal melanoma were CD4+ dominant. While the effectiveness of T-cells against the tumors was much higher in cutaneous melanoma, researchers found a subset of T-cells in uveal melanoma that had robust anti-tumor reactivity, comparable in magnitude. Knowing that a subset of uveal melanoma tumors with the ability to provoke an immune response exists opens the door to further research. Doctors can build on this knowledge to potentially discover therapies that will boost anti-tumor T-cell production and/or effectiveness to successfully treat this form of eye cancer even after it spreads.. In addition to his daily work treating his own patients at the NYECC, Dr. Finger is committed to advancing research that will benefit people diagnosed with eye cancer around the world. In that spirit, Dr. Finger is working with the Ophthalmic Oncology Task Force to create a database on vitreoretinal lymphoma that will ultimately lead to more effective treatments and better patient outcomes. Primary vitreoretinal lymphoma (PVRL) is a variant of central nervous system lymphoma with initial or primary manifestation in the eyes. It is a typically aggressive, diffuse large B-cell malignancy. Patients diagnosed with PVRL generally have a poor prognosis. Currently, there is very little evidence-based, statistically significant information about vitreoretinal lymphoma. To gather this vital data, Dr. Finger and the Ophthalmic Oncology Task Force have create an International Vitreoretinal Lymphoma Tumor Registry. Information gathered through the registry will help determine the best local and systemic treatment strategies. Because vitreoretinal lymphoma is often associated with central nervous system lymphoma, this information will help save both vision and life. The goal is to register 2,500 cases of vitreoretinal lymphoma in the database from participating centers around the world. Each center must be able to enroll at least 50 cases diagnosed between the years 2000 to 2015. The database will anonymize patient information and conform to all privacy standards. All data mining related publications will include two authors from each center. Though there will be a group authorship as primary, each center will be listed in order, according to the number of patients entered into the database. The ultimate success of the Vitreoretinal Lymphoma Tumor Registry will depend on the participation of retinal specialist, ophthalmic oncologist, and hematologist oncologist. If you are a physician specializing in these areas and you’re interested in participating in the registry, please contact Dr. Finger at pfinger [at] eyecancer [dot] com. Your smartphone camera flash can detect a rare eye cancer, potentially saving a child’s life. That was the case for an Arizona mother who inadvertently detected retinoblastoma in her young son after using a flash phone camera to take pictures of him. Andrea Temarantz noticed a white glow in the left eye of her son Ryder in the photographs she’d taken. Suspecting it was due to a faulty phone camera, Temarantz switched to a better device. When the white spot remained, she took Ryder to see a doctor. The physician identified a tumor, and diagnosed him with retinoblastoma, a potentially fatal eye cancer. While rare, retinoblastoma is a very aggressive eye cancer found almost exclusively in young children. Leukocoria (white pupil) and misaligned eyes (strabismus) are the most common symptoms. In other cases, the child may have developed neovascular glaucoma and may be in pain. Retinoblastoma treatment typically requires the cooperation of an ophthalmic oncologist, pediatric oncologist, and radiation therapist. Over the last 30 years, treatment has evolved from enucleation (removal of the eye), to eye-sparing radiotherapy. More recently doctors have treated selected patients with chemotherapy-based multi-modality therapy. An early diagnosis is critically important for successful treatment. Retinoblastoma is almost always fatal when left untreated. When flash photography creates a white pupil in the eye of a child, it could be that the light is illuminating a tumor not otherwise visible. 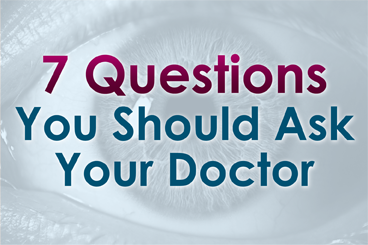 While a white spot in the eye is not always indicative of a tumor, a visit to the doctor for a diagnosis is always a good precautionary measure. Temarantz’s experience was not an isolated case. A Rockford, Illinois, child owes his life to a camera flash and a vigilant parent. Julie Fitzgerald noticed a white spot in showing up in photos of her son Avery’s left eye. After reading stories online about similar cases, she decided to take her son to see a doctor. Avery was ultimately diagnosed with retinoblastoma. Unfortunately, his left eye had to be removed, but the diagnosis saved his life. Using a smartphone’s camera flash to detect a potential instance of retinoblastoma is effective enough that the UK-based Childhood Eye Cancer Trust conducted an ad campaign in 2014 to raise awareness of its life-saving potential for early detection. A drug thrust into the limelight by Jimmy Carter shows promise for treating melanoma of the eyelid. Keytruda (pembrolizumab) gained FDA approval for limited treatment of metastatic melanomas in late 2014. The agency gave its blessing for front-line treatment in patients with unresectable or metastatic melanoma on Jan. 7 of this year. The drug is a form of immunotherapy and works by unleashing the body’s immune system to attack cancerous melanin cells. If the cancer is not caught early, it can spread deep into the skin and spread to other organs. At that point, chemotherapy becomes generally ineffective. Testing has shown Keytruda can drastically increase survival rates for advanced skin cancer. Keytruda is what is known as a PD-1 inhibitor. T-lymphocyte cells are the body’s primary cancer fighter. Tumors express proteins called PD-L1 and PD-L2. These “program death” proteins lure T-lymphocyte cells to bind to them. Eventually, this results in T-cell exhaustion and reduces their ability to fight the cancer. Keytruda works by targeting the PD-1 receptors, allowing the body’s immune system fight the cancer cells. UConn doctors say they have had great success using Keytruda, according to Dr. Upendra P. Hegde, an associate professor in the Department of Medicine. A study reported in the Wall Street Journal last spring compared Keytruda to an older immunotherapy called Yervoy. The study revealed a significant increase in overall survival rates. A similar drug approved for melanoma treatment has shown similar promise. Opdivo (nivolumab) works in the same way as Keytruda, blocking the PD-1 receptors. A study presented at the 2015 Society for Melanoma Research Congress showed the 2-year overall survival rate with frontline nivolumab was 57.7%. Jimmy Carter underwent treatment for his melanoma with Keytruda. He was diagnosed with an aggressive form of skin cancer that had spread to his brain and liver. In December, the former president announced he was cancer-free, putting the cancer-fighting drug in the national spotlight.